We just witnessed a HUGE VICTORY for gun owners in Minnesota! For weeks you and I have fought tooth and nail against the DANGEROUS ID act, pouring calls, emails and Facebook messages into the capitol telling the legislature to vote NO on Dangerous ID. Today, thanks to all of your hard work, the Senate voted DANGEROUS ID down by a vote of 38-29! As you know, Dangerous ID would have enabled the Secretary of the Department of Homeland Security to arbitrarily require a Dangerous ID for purchase of firearms, ammo and virtually anything else he wants. The anti-gun League of Minnesota Cities said YES. Notorious anti-gun factions of Minnesota House leadership said YES. 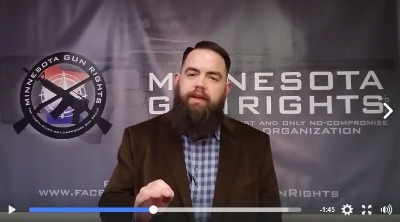 Even the establishment “gun lobby” organizations here in Minnesota, always the first tuck tail and run at the sign of a hard fight, hung their heads and ran interference for their pals in the legislature. But not Minnesota Gun Rights – or the thousands upon thousands of our members and supporters like YOU across the state that make this organization so effective! You all sent a great big fat HECK NO to the Minnesota Senate today! And they got the message. For more information on today’s vote please click on the video below and watch the exciting update from our Director! We can’t thank you enough for all you’ve done in defense of our gun rights in Minnesota. If you’re not yet a member of Minnesota Gun Rights, this is the best time to join! We and our members are Minnesota’s hardest hitting and ONLY no-compromise gun rights organization. We don’t exist to play games at the capitol. We don’t exist to be patted on the back by politicians. We don’t exist to provide political cover like so many other organizations that lurk around the capitol! We exist for one reason only and that is to defend and advance our Second Amendment freedoms – no matter what. So if you’ve not yet signed up as a dues paying member, please click HERE to do so now. But now isn’t the time let up on our guard! The anti-gunners are not going to sit on the sidelines and watch their dreams of centralizing gun-control go up in smoke! Capitol insiders are already telling us that anti-gunners are quickly reforming their approach by working on another bill or even amending this language on to another bill! But for now, thank you so much. contacted at 952.451.6115. It’s web address is www.MinnesotaGunRights.org. Not produced or paid for at taxpayer expense.